Do you know, an artful door can make a huge difference in your life? The overall elegance and look of a beautifully designed home will not only make you fell in love with your dwelling, but also make your guests die-hard fans of your space. You can achieve the look by using distinct architectural design, furniture, lighting, fixture, windows or doors. Yes! That’s true. You can add a modish touch to your home by installing elegantly designed doors. According to AmerAdnan®, an artful entrance door has the ability to make a statement for your home. Similarly, the doors of your rooms also contributes towards it. This is why architects and interior designers give a great deal of thought when it comes to choosing the entrance and interior doors. If you are also one of the homeowners that are seeking interior doors for home, then here is a guide from AmerAdnan Associates, one of the leading architecture companies in Pakistan, will help you choose the right interior doors for your home. Please continue reading below to know more. i. Sliding Doors: These are primarily made out of wood and are usually lined with glass or mirrors. The sliding doors are also used as closet doors in many homes. The best thing about sliding door is it take up minimum space because it slide along the wall instead of swinging up. ii. Pocket Doors: The pocket doors can be installed in any part of the home. They are usually installed in turn-of-the-century homes. The key reason behind their popularity is their space-saving construction. Unlike sliding doors, the pocket doors do not slide along the side of the wall, but into the wall. This saves a lot of space and make them safer to use. iii. French Doors: As the name suggests, the French doors have taken inspiration from the French architecture. They come with a frame that is crafted around their transparent panels and filled with a translucent material, which is mostly a frosted glass or acrylic sheet. The main aim of using translucent panels in French doors is to allow maximum light in a room. The French doors can be seen in many luxury homes in Pakistan these days owing to their popularity and unique design. iv. Folding Doors: The folding doors are manufactured in bi-fold form. They either fold on the inner or outer sides. The folding doors are best for use in closets, pantries and laundry rooms, but they are also installed as separators between drawing/dining rooms and the lounges. v. Barn Doors: As the name implies, these doors were originally seen on barns. The barn doors can be adopted for interior as well as for the exterior in residential buildings. The rooms that are decorated with a rustic or industrial look are best for installing barn doors. vi. Panel Doors: The panel doors can be commonly seen in the houses today. They are usually made out of MDF or wood. 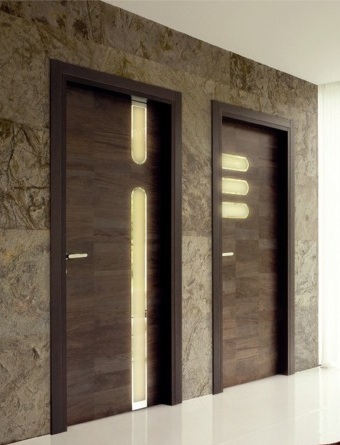 The classic pattern of square panels in these doors differentiate them from all other types of interior doors. vii. Dutch Doors: The Dutch doors are inspired from German architecture. The half horizontal panel of the Dutch doors allow its top half to swing open. As the Dutch doors swing open, their bottom half remains closed.